Not sure why, but pretty much anything with a skull design is sure to please her. For Mother’s Day this year I thought I’d use my new hobby to create a skull gift for her. I scoured Etsy for a skull related design I liked. There were very few that weren’t Day of the Dead style. 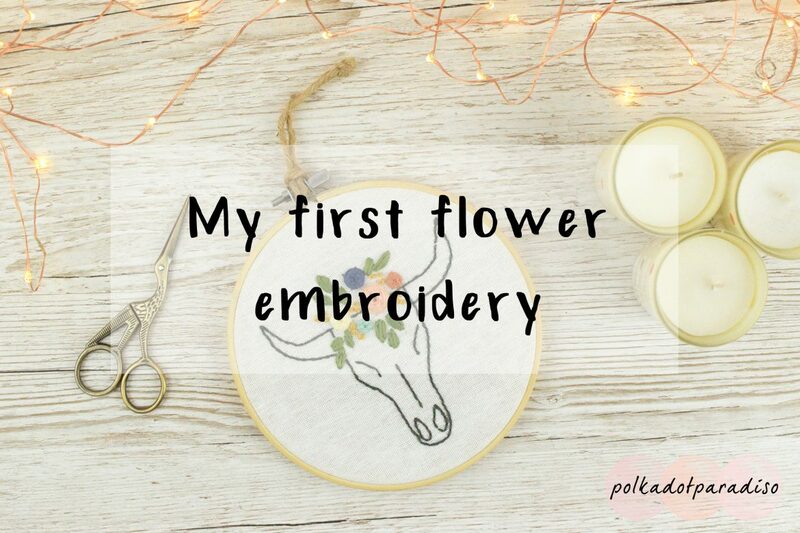 There were a few cross stitch designs that I found, but I had my heart set on an embroidery. While scouring Pinterest I came across a free design here. It was perfect. An unusual skull design decorated with beautiful flowers. I was daunted by the flowers as I’d never attempted them before but the free design come accompanied with fantastic instructions and links to great You Tube tutorials. I therefore ordered the supplies and gave it a go as my first embroidery piece not using a kit. I realised I didn’t order a pen to draw on my embroidery fabric with. Instead I used a pencil. Without having a light box I used my desk lamp to trace the design. Not exactly the best way of doing it, but it actually worked out okay. I started with the outline as that was a nice easy backstitch. Next I moved onto the satin stitch for the leaves. I absolutely hate this stitch. While the creator of the design said they were too small to outline I had to outline them first. Trying to get the satin stitch right for the first time without a stitched outline to follow was far too difficult for me. Even with the back stitch the leaves didn’t turn out anywhere close to perfect. Next up was the rose stitch. To look at on the design you’d think it must be complicated. It was actually a really nice surprise and super simple to do. I love how something so simple can end up looking so intricate and pretty. Having looked at more tutorials there was a way of finishing off these stitches that I either missed or wasn’t in the linked tutorial. A way to not see the ‘star’ lines underneath that you use to weave the thread through. The final stitch to finish this off was a french knot. French knots I find are great once you get into the swing of them. The first few on any project I do are always a little off. Usually I’m not pulling the thread tight enough and rectify that around three knots into the design. I left this in the hoop and added some rustric looking string to it. I think it looks better than putting it in a frame. This was a lovely little project that was a nice weekend make. I highly recommend checking out the rest of the Little in Bits blog as there’s quite a few free designs on there and the instructions are great. I’d like to keep doing projects that add a couple of new stitches each time – although I definitely need to do more satin stitch practice before I don’t consider that a ‘new’ stitch anymore. The fabric used for this project for 28 count Quaker Cloth in antique white and all thread is by DMC.